When the Bee was two she went to her "school" while I was teaching and one of her favorite things to do at school was play with shaving cream. So much so that we often played shaving cream at home too. I had kind of forgotten all about shaving cream play until the other day when I was trying to think of something fun for The Bean, almost 2, to do. 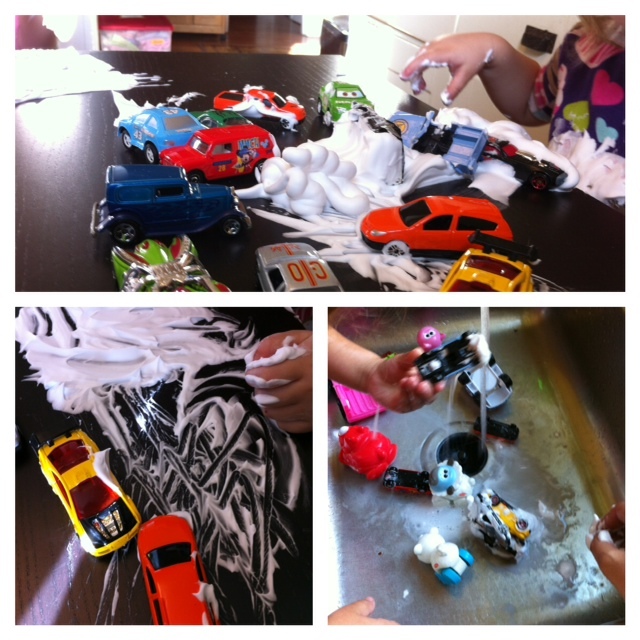 I found some shaving cream and to make it a little more fun I got out our bin of little cars and things with wheels. I squirted some shaving cream onto the table and let them go. They both had a blast! The Bee spent most of her time burying cars in shaving cream, while the Bean was just fascinated by the foam, touching it and smearing it. When they started to loose interest we took our cars to the sink and they spent another 20 minutes washing all the cars off. I spent the whole time singing "Car Wash" so of course we had to follow it all up with a little soul train. I recently saw this idea and was very inspired. I did a post today about our shaving cream fun and linked back to you.